In 1892, William Painter changed the trajectory of the beverage industry with the invention of the bottle cap. Throughout 2017, the company that Painter founded, will be celebrating its 125th anniversary by highlighting its long-standing commitment to innovation, quality and sustainability. 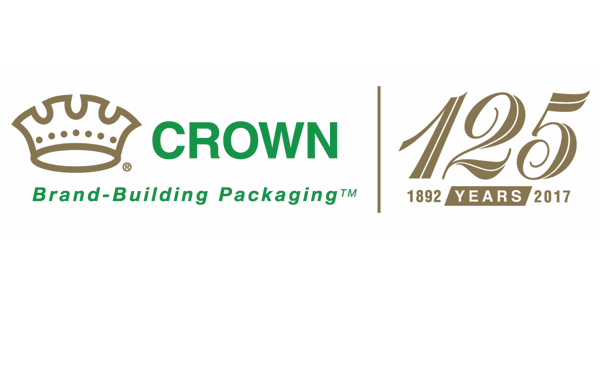 Since its founding as the Crown Cork & Seal Company of Baltimore, Crown has built a diversified portfolio of metal packaging technologies to support the beverage, food, personal care, household and luxury markets. It currently operates 146 plants in 36 countries and employs approximately 24,000 people. SuperEnd beverage ends reduce metal use by 10% and make beverage cans even more environmentally friendly. Reveal temperature sensitive inks offer brand owners a unique opportunity to increase engagement with consumers before, during and after beverage consumption. To help McCall Farms bring convenience to the food service industry, Crown developed a unique variation of its 603 diameter (153mm) easy-open end, which eliminates the need for a can opener. Bi-compartmented (or BICAN) aerosol technology incorporates a plastic inner bag to keep product and propellant completely separate. Crown’s new vacuum metal closures are suitable for brands considering a switch from glass to PET containers but want to retain the benefits of metal closure technology such as superior heat transfer during the heating or cooling processes. Suitable for use on large mouth (63-82mm) PET containers, the new range can be fully decorated and can be applied with the same equipment currently used to apply a metal closure to a glass container.